An elegant way to celebrate. Celebrate! Send your best birthday wishes with two splits of classic Domaine Chandon Brut Sparkling Wine surrounded by our finest gourmet foods. 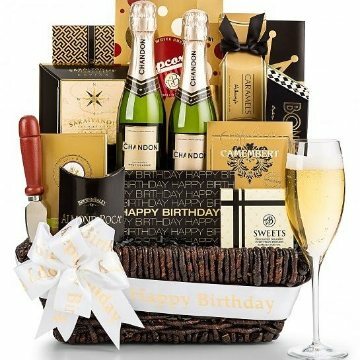 This gift basket includes the following: Two 187-ml Splits of Chandon Brut Classic, Signature Saraivanov Caviar, Camembert Cheese, Herb-Encrusted Crackers, Gourmet Seasoned Popcorn, A cheese knife for easy serving. Domaine Chandon Brut - Nutty flavors with hints of brioche that build to a refreshing dry finish. The wine delivers complex apple and pear characteristics accented by citrus spice over notes of almond and caramel in the bouquet. If any substitutions are necessary, they will be made with items of equal or greater value. Please note that this gift is only available for purchase and receipt by persons over 21 years of age. Presentation-ready packaging with hand-tied ribbon. Measures 17" x 14" x 9".